FIRST install the driver from CD or online driver link, driver Download link: https://bit.ly/2HYy8qI then insert your usb wifi dongle into your device and input your wireless password.Finally it works! Tips: If you can't install the CD driver or do not know how to use it, please contact us by Amazon message. 1:Works well with Any WiFi Routuers,easy to use, you can simply insert the adapter to get connected once you've installed the CD and run the software. 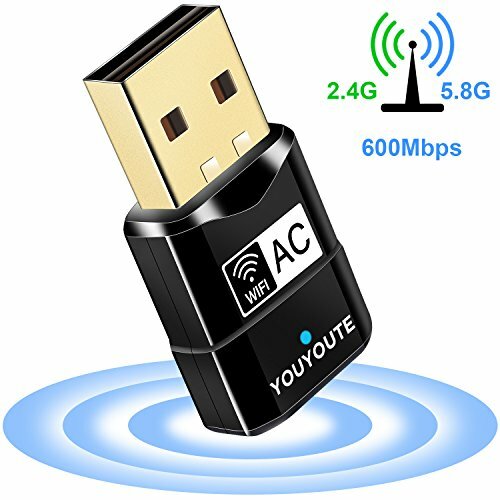 3:Dual band 2.4G/ 5G Wifi adapter, enjoy better performance and greater flexibility for your Wi-Fi device.5 Ghz mode stands out within short range. If your router is close to wireless network card ,then wifi signal will be stronger under 5 GHz than 2.4 GHz . If the wifi adapter dongle is away from the router, then you will get a better signal under 2.4 GHz. 4:Maximum Wi-Fi speeds of 150Mbps (2.4GHz) or 433Mbps (5GHz). 5GHz at 433Mbps is ideal for seamless HD streaming, online gaming and other bandwidth-intensive tasks.While 2.4GHz at 150Mbps is enough for web surfing and online chatting. Shift between two bands, you have optional wifi internet connection for your pc, desktop. 5:Mini size design.space saving and easy to carry. 6:Heat dissipation holes,no fever and performs. Wide Compatibility: Support for win 10 / 8 / 7 / XP / Vista ( 32-bit/64-bit ) and Mac OS X 10.4 ~ 10.12.2 system. Install the driver with the included Set-up CD or the download link:https://bit.ly/2HYy8qI, and then plug the wireless USB wifi adapter into your device once the drive is correctly installed.